We’ve got it: It’s important. Even so, we’re getting just a little bit played out, seeing that ever-changing electoral map every time we turn on CNN, Fox News, MSNBC—maybe even Syfy, Oxygen, and GOD TV. So let’s head to the realtor.com electoral map! It’s long been known that Democratic strongholds, largely based in the Northeast and California, tend to be wealthier. Lucky them! The median household income in those states is $62,564—about 23 percent higher than red states, where it’s $50,820, and 13 percent more than in swing states, at $55,524. And on top of that, 1.4 percent of households in left-minded blue states bring home $500,000 or more, which makes sense when factoring in all those six- and seven-figure bonuses on New York’s Wall Street and tech fortunes in California’s Silicon Valley. The percentage of folks making half-a-mil-plus bank may not sound all that high, but it’s 133 percent more than the percentage in right-leaning states and 75 percent more than in purple states. Since liberal state denizens are earning more, it’s not exactly a tremendous leap of logic that their residences are also worth more. The median home value is $301,000—a whopping 91 percent more than more conservative swaths of the country and 59 percent more than those middle-of-the-road regions of America. 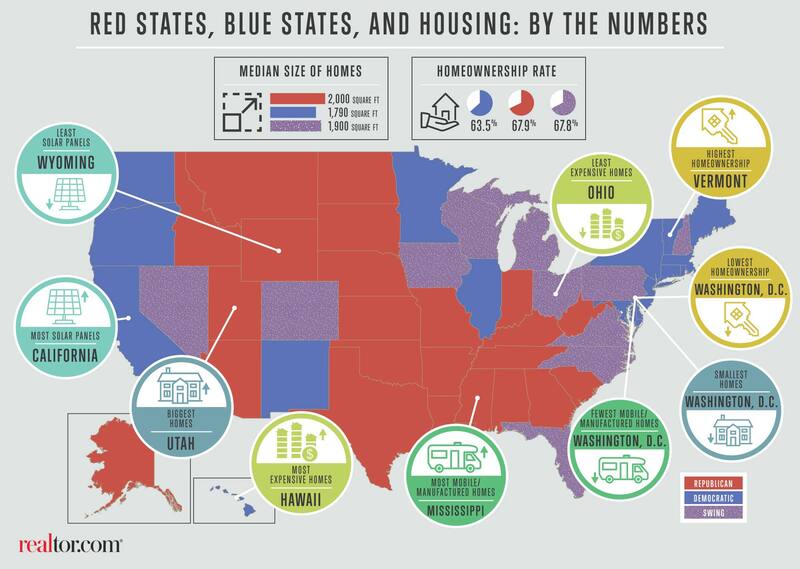 Hawaii has the most expensive homes, followed by Washington, D.C., and California. Despite those higher incomes in liberal parts of the U.S., homeownership is highest in red states, where it simply costs less. About 67.9 percent of households in Republican-supporting states are homeowners—compared to 63.5 percent in Democratic strongholds and 67.8 percent in swing states. And the city with the highest homeownership rate is in another liberal stronghold, San Jose, Calif. The Silicon Valley city is one of the most expensive markets in the nation, as the next big tech stars compete over the very limited number of homes on the market, pushing up prices. The median list price of homes is $767,000 in the city, according to realtor.com. Washington, D.C., the blue district that isn’t quite a state, has the lowest homeownership rate, followed by New York. Miami, in the swing state of Florida, was the city with the lowest rate of homeownership. Many buyers in red states may not be raking in a ton of dough, but achieving the American Dream of homeownership only requires them to fork over about 26 percent of their median household income. Meanwhile, it takes 32 percent of a household’s income to buy a place to live in a blue state. In a purple state? It’ll run you about 25 percent of your income to purchase your own place. That’s quite a chunk of change—52.1 percent more than those in red states, where tenants shell out an average $904 a month. And it’s 34.9 percent more than renters are paying in purple states, at $1,204 a month. 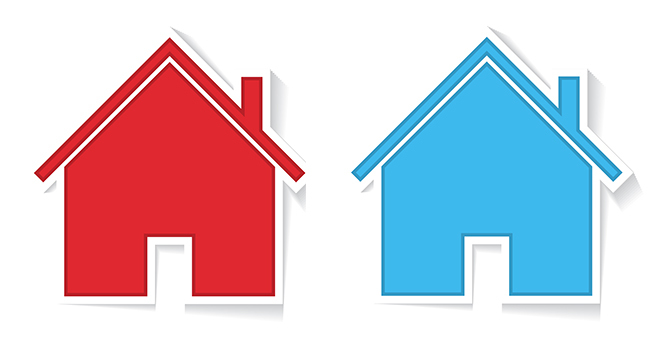 Blue state buyers may not own as many homes, but residents in those areas are 14 percent likelier to own a second home. Got that? They’re also 9 percent more likely to own real estate as an investment. Since many of the blue state cities are older than their red peers, the housing stock also has quite a bit more history. About 19 percent of all houses were built in or before 1939 in left-leaning hubs. That’s 95 percent more than red states, and 36 percent higher than in purple states. Those living in conservative states are 33 percent more likely to live in mobile homes, often found in trailer parks. They’re also most likely to wind up in manufactured abodes made in factories. The fewest mobile homes? Washington, D.C., and the blue state of New Jersey. The city with the lowest percentage of these homes is super-expensive San Francisco. Liberal states tend to have more eco-friendly residents, who are 12 percent more likely to have solar panels installed on the roofs of their homes than those living in other states. The most panels by sheer number were installed in the blue state of California, whereas Hawaii has the highest percentage of residences with the eco-friendly power source. Silicon Valley’s San Jose, Calif., is the city with the highest percentage of homes with solar panels. The fewest number of panels are in the red state of Wyoming. Memphis, Tenn., was the city where the smallest percentage of residents invested in them. This article was originally posted on www.Realtor.com.